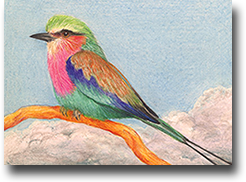 Our journey with the birds has been a co-creative partnership, both with one another across two hemispheres – Jane as author and Joyce as artist – and with the bird kingdom. It has been the most extraordinary, magical unfolding of a whole new reality. The process of writing the text and drawing the pictures has been like going through our own private mystery schools for both of us. Our encounters with birds have been raised to a level of sheer magic and mystery. This is the story of how it came about. On New Year’s day in 1999, while in a deep meditation, Jane was told to listen to her inner voice and write down what she heard, after previously wondering about the metaphysical nature of bird energy and what it offers to the planet. Jane listened and wrote what she heard (none of it was information she knew consciously) – and the result was the first Bird Card – the Pigeon. 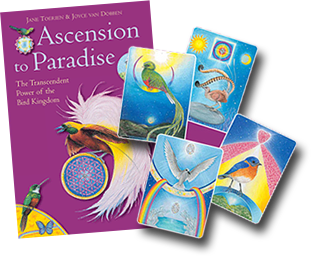 Jane then went through a transformational process where the subtle healing qualities of 55 birds were revealed to her, over a period of about a year, and these were written as the text of the Bird Cards: The Healing Power of the Bird Kingdom. In the course of that year, Jane, who lives in Cape Town, South Africa, was put in touch with Joyce, who lives in Spaarnwoude, the Netherlands. There was instant recognition that Joyce was the right artist to illustrate the cards. Joyce then began her own transformational process, as she beautifully illustrated each card, using metaphysical symbols to illustrate the quality that each bird is expressing. 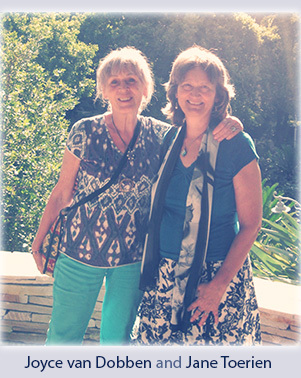 Joyce and Jane only met physically at the end of the process when Joyce had finished all the pictures, but from the beginning it has been a wonderful partnership across the northern and southern hemispheres! 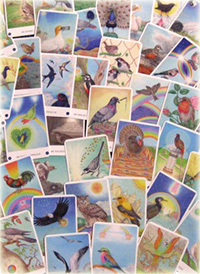 The original first set of Bird Cards went out of print in its original format, and the new pocket edition published in 2014 replaced it, with the same illustrations and a slightly reduced text. This unfortunately also went out of print, and is now available only directly from Jane. You are moving on the wings of Light to a new harmonic. We know about sound, and we know about flight. We can lift you up and help you to fly. These Bird Cards are given to you all to connect you with us, so that we can begin our task of moving you to this lighter expression of yourselves. We do things joyously, so this will be joyous too. Each of you is beautiful beyond your present very limited conception of yourselves. We see the beauty in you; we know where you have come from and we know where you are going – come with us. Do not ever get bogged down in fear and apprehension about this process of becoming a lighter version of yourself; just ask us to be there and we will. We know that it is a difficult challenge to be in a physical body. We can lift you up until you remember Who you are. The next step of the journey occurred in 2003. Once Jane had submitted the manuscript to the publisher, it became clear that this was by no means the end of the process and that there was another set of Bird Cards to write! Over the next year, 66 more birds were described, some well-known and some not so well-known. Joyce then took 5 years to illustrate them, a real labour of love. This is the second set of Bird Cards, published as Ascension to Paradise: the Transcendent Power of the Bird Kingdom. At the end of the second set is a Glossary, which covers almost all of the birds in the world. 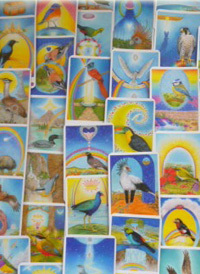 If you look up a bird that interests you, it will tell you which one of the 121 cards you should read that is closest to its energy. This means that people all over the world can enjoy the Bird Cards and relate them to the birds that they encounter in daily life. The last bird, number 121, is the beautiful Bird of Paradise, featured on the front cover. Like other oracle cards, the Bird Cards can be used as a way of mirroring back to one the issues that are current in one’s life, to help one to transcend and transmute them. But they can also be used to understand the meaning of a bird that has appeared in a dream, a meditation, or a significant encounter. All is well in life. We know that all is well. Allow the noisy strife of the world to fade away and go where Truth is – in the song of the birds, the ripple of the tides, the stillness of the great mountains. There is a birthing, and a remembrance, taking place. All around, life is awakening and remembering that now is the time. Now is the time to lift up, back to the knowledge of our Oneness with all things, back to joy. Let us help you – we can help you to let go of your heaviness and learn to sing with us. There is so much joy for those who will lift up their wings and fly. Jane Toerien lives in Cape Town, South Africa. 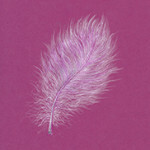 She works as a complementary health practitioner, using the Bird Cards for insight and support. She discovered bird watching as a teenager and has enjoyed taking note of the birds that cross her path ever since.Joyce van Dobben has also always had a strong connection to birds and nature. She lives and works as an artist in the countryside in Spaarnwoude, The Netherlands. Joyce takes orders for handpainting nature designs on porcelain and on feathers. Jane or Joyce can be contacted on info@birdcards.net.